Hi everyone, this is my first post and hope you like it. Today we will talk about building a Restful project using maven and jersey libraries. For this to be possible maven archetype, a tool to build projects out of templates, will be used. In this tutorial we will be using command line maven, you can download and follow the installation intructions on http://maven.apache.org/download.cgi. 2 - Archetypes will be downloaded from the catalog. After downloading you'll see this message "Choose a number or apply a filter", type 3. 4 - Next, a confirmation message will show up, just type Y and your project will be created. 6 - The result of previous step should be BUILD SUCCESS, which means that now you already have your rest project fully configured, compiling and ready to be executed. After doing all these steps you will have import the project into your IDE. In this example eclipse will take place, but be free to use your prefered IDE since maven is IDE agnostic. 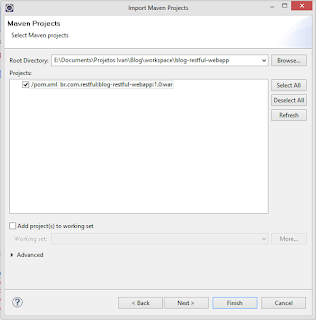 Open eclipse and click with the mouse right button on Project Explorer -> Import -> Existing Maven Projects, select your project and click Finish. Now you can take a look on the class created by the template in br.com.restful.MyResource. 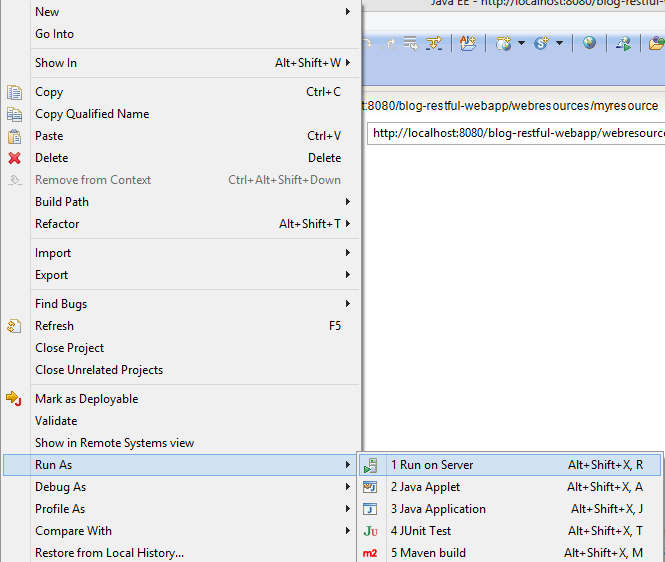 Next, click on the mouse right button over the project and run on your server. In this example we used Tomcat 6. A page like this should appear. http://localhost:8080/blog-restful-webapp/webresources/myresource, remember that port should be set accordingly to the server configuration. On this case we used tomcat default port which is 8080. 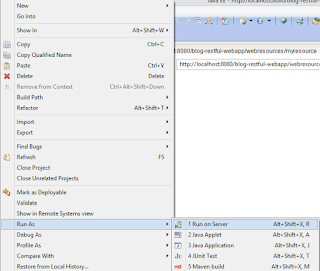 The template initial configuration establishes that all rest services stays below webresources. This could be easily changed but this is a subject for other post. Hope you enjoyed it and see you later. Pra ganhar um 10 com estrelinha, faltou colocar um mvn eclipse:eclipse. Ola Ivan parabens pelo post me ajudou muito ! Voce teria algum exemplo utilizando json? Obrigado pelo feedback Rodrigo. No meu github https://github.com/ivanjunckes/rest-client-api-example tem um exemplo de como fazer com JSON. Basicamente você vai ter que mudar o valor dentro de @Produces para application/json.